Baseball pitching drills are something you have to be careful with. Our shoulders have a problem standing up to all the wear and tear of pitching. And our elbows were not made to throw breaking pitches. So drills that involve the pitching arm and shoulder have to be closely monitored. I may sound over cautious about this, but kids love to throw breaking pitches. And if they are twisting their arm even slightly while pitching, it doesn’t take long to do some damage. I know, because I have a mushy elbow from improperly throwing curve balls as a youth. So if you are a pitcher, learn the proper way to throw breaking pitches. It could save your pitching career. One big hint, your elbow should not hurt after pitching. If yours does, your pitching mechanics are wrong. The two baseball pitching drills I’m going to show you below are drills that go hand in hand with throwing bullpens and doing long toss. 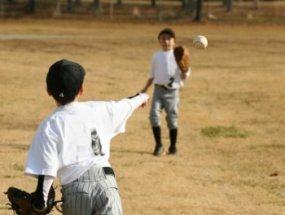 Throwing bullpens and playing long toss were discussed in the article Little League Pitching. Please check it out if you haven’t already. In my opinion, the following two drills, along with long toss and bullpens, offer the best opportunity for pitching performance improvements. A college pitching coach once told me that for every inch closer to home plate that a pitcher released the baseball, the speed of the pitch was increased. He believed almost all high school pitchers could reach out at least two more inches before releasing the baseball. And he believed that would add 5 or 6 mph onto their pitch. I do agree with him that reaching out farther will add speed to a pitch, I’m just not sure how much speed it will add. But I do know that striding out farther when pitching will help you release the baseball out farther. With that in mind, the following drill should help you increase the speed of your pitches. 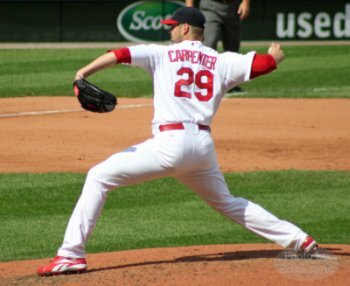 One of the best, but seldom used baseball pitching drills is the “Pitching Stride Drill”. This drill will help you add speed to your pitches, and teach you to stride straight towards the plate. This drill works best when done on a pitching mound, but if one is not available then flat ground will work. 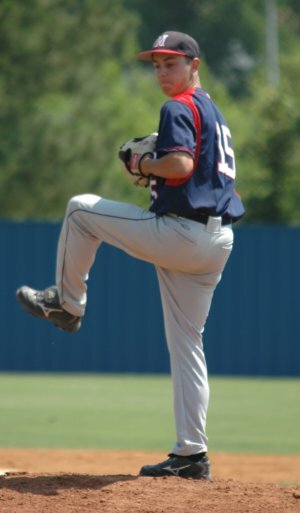 A baseball pitcher should stride at least three fourths (75%) of his height. And the closer he can get to 100% of his height the better. So, a pitcher 5 foot 8 inches should stride at least 51 inches. (68 inches times .75 equals 51 inches) And 51 inches should be his minimum. You can do this drill with or without a catcher. Obviously, it will be more helpful with actually throwing a baseball, but you can do this drill without releasing the ball. First you want to draw a straight line from the spot your foot touches the pitching rubber then towards home plate. What we are looking for here is to see if you are striding in a straight line towards home plate. Any variance to the left or right will slow down the speed of the pitch, and could also lead to arm injuries. It is very important to stride directly towards home plate. Practice this until you can do it without even thinking. The second thing to do is measure from the pitching rubber out to the distance you want to stride. Remember, it should be at least 75% of your height. And you want to really be working towards a stride of 100% of your height. Now you have the markings where your front foot should land. Again, you can do this without a catcher, but actually pitching is best. Also, if possible, have someone stand near the mound and observe where your front foot is landing. This will give you a more accurate spot. This drill can be done while also throwing a bullpen. You want to work on this drill as much as you can, so doing it during a bullpen is great. Just remember to stop when you have reached the number of pitches for this bullpen. You could continue with this drill without pitching the baseball. Keep working on both parts of this drill, the striding straight and striding as far as possible, until you are reaching your goal and feeling comfortable doing it. You should see an increase in your accuracy and your pitch velocity in a short amount of time. Even if you feel your arm strength is good, a longer stride will help you raise your radar gun numbers. One of the baseball pitching drills that kids really get a kick out of doing is the “Point Game". It helps calling this drill a game because it makes the players like it that much more. And any drill that involves a little competition is also a big hit. So, lets have some fun while working on your pitching mechanics. I talked about this drill in the “Baseball Throwing Drills” article. In that article we were using the drill to help players with their throwing accuracy. Here, we want to use it for their pitching accuracy. This baseball pitching drill is all about accuracy. Here, two boys play catch standing apart the pitching distance of their age group. The throwing player gets points for where his throw is caught. A throw at the other player’s body between the knees and the waist line (pretty much the strike zone) is worth 3 points. A throw at the other player’s body between the waist line and the shoulders is worth 1 points. Any throw that is below the knees or above the shoulders is a 1 point deduct. Any throw that hits the ground or goes over the head of the other player is a 3 point deduct. The player catching the baseball holds it where he caught it until both players decide the points for that throw. There will usually be a few disagreements in the beginning, but very quickly both players understand they have to be fair in their calls. First one to 21 wins. There are other baseball pitching drills that can be found on the internet. But the problem with them is they are not very helpful, and the boys hated them. You can do the “balance” drill or the “pause” drill, but I never saw any improvement from my pitchers with these drills. Doing long toss, throwing bullpens, and the above two drills always brought improvement to the pitchers I coached.